A new class of fuel-efficient and environmentally friendly twin-hull vessels is currently under development. Compared to high-speed catamarans, a significant reduction in speed combined with an increase in deadweight tonnes will lead to a highly efficient medium-speed catamaran design. Recently-built conventional and high-speed ferries are compared to each other in terms of length, speed, deadweight and transport efficiency to classify the new design. The goal of this study is to find a preliminary macro design point for minimum total resistance by considering the main particulars of the catamaran vessel: block coefficient, prismatic coefficient and slenderness and separation ratios of the demihulls. Publications containing recommendations towards the optimum hull form parameters for moderate Froude numbers are reviewed and existing experimental data analysed to identify parameters for this new class of vessel. 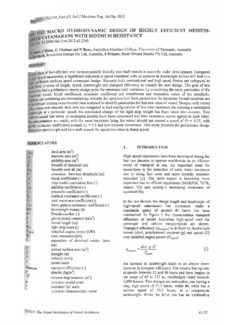 Designs with varied L/BOA-ratios and constant deck area are compared to find configurations of low total resistance for carrying a nominated deadweight at a particular speed, the associated change of the light ship weight has been taken into account. Two different model test series of catamaran models have been considered and their resistance curves agreed to each other. Recommendations are made; with the most important being the vessel should not exceed a speed of Fr = 0.35, with optimal prismatic coefficients around CP ≈ 0.5 and low transom immersion. This study presents the preliminary design of medium-speed single and twin-hull vessels for operations close to hump speed.